So Corne Mulder, the Chief Whip of the Vryheidsfront Plus (in English – the Freedom Front Plus – known as VF+ or FF+) in SA’s parliament, stands up in front of about 1000 delegates to a national ‘social cohesion’ conference – convened by government, in Soweto (a remarkable home of social justice activism over many years) – and calls for a government ministry to centre on minority rights and affairs in order to remedy much needed ‘social cohesion’. The concept sounds of interest to minorities, but – hey – let’s dig a little further. I awoke this morning to find out I was quite right in my initial reservations. Gawd dammit – I hate being proved wrong when I look to trusting the common decency that should be inbred amongst all humankind. As a gay man, I understand the concept of minority rights and the protection thereof. As a child of the African soil – and deeply passionate about my own sense of inclusiveness in this ‘rare earth treasure’, I feel constricted in my own “freedom to choose and freedom to associate”. Via basic human rights. In simple terms – I was born in Zimbabwe and, aside from many other social justice issues I’ve supported there, I’ve given my public support to gays and lesbians in my motherland, in terms of fighting for their own minority rights. The government of my birth-land views me – through their legislation – as an enemy of the state. I fear travelling there because of the potential consequences. Likewise, I dearly want to explore the rich natural diversity and heritage of East Africa – something I’ve never done – but I’m constrained by homophobic laws in Uganda, where I’m on record as having supported certain campaigns. People have said to me that I must go and experience the great ‘Serengeti-Mara’, that I dream of, and witness the utter freedom of the greatest hoof-footed migration on this planet. I reply by saying that it’s all well and good for folk to separate issues into human and natural protection rights, BUT – if I can’t visit a key region (East African Community) in peace, to experience, observe and comment upon, publicly, then I make certain rights subservient to others, and that then creates a private conundrum for me. The Freedom Front Plus has a mere 4 seats in a parliament, out of the total 400, and their Chief Whip is Corne Mulder. In 2009, they secured 0,83% of the national vote with almost 150 000 votes. For several years, they were aligned to the labour union group, Solidarity, that sponsors the rights activist group, Afriforum. Solidarity – a few years back – switched allegiance from the VF+ / FF+ to the Democratic Alliance (DA). Solidarity has around 150k members and they’re part of the essentially ‘white’ CONSAWU – Confederation of South African Workers’ Union – and thus Afriforum and, indirectly the DA. Whether one likes it or not, this is why I struggle to support the DA. Here’s a ‘right-wing’ racially-designated trade union group – that is probably no more than 15% in terms of membership for SA’s largest labour formation, COSATU (Congress of South African Trade Unions), and which is seemingly racially-defined – and the DA’s seeming support base of ‘white, economic capital’ that promotes ‘free-market agenda’ without what I deem as a more socio-economic, transformational base in the face of human inequalities. Afriforum’s recent blitz over Woolworths and related Employment Equity issues places them – and their supporters – in the space of narrow-minded rights’ protectionists – seemingly racist – in a sea of many civic and minority rights’ abuses by government and statutes. And the DA stays silent. 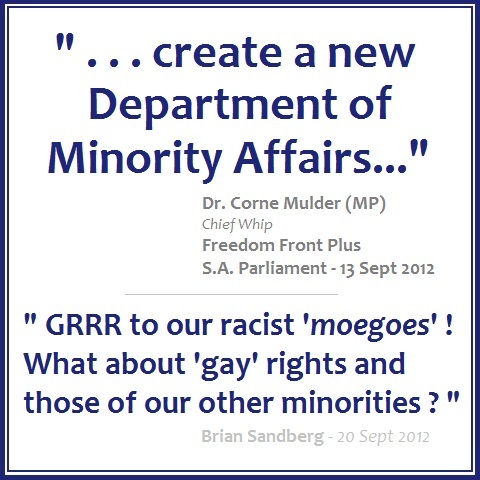 Corne Mulder introduces the concept of a ‘Department of Minority Affairs’ in parliament, and the DA stays silent. HERE’S THE FOOD FOR THOUGHT . . .
We have a national ‘social cohesion’ conference on 04 July 2012 in Soweto, sponsored by the Department of Arts and Culture. Corne Mulder speaks and delegates ‘laugh out loud’ . . . He then addresses Parliament on this key issue the FF+ promote, and MP’s are taken aback . . . The media, generally, ignores this issue and so potential oxygen dies out. However – Aubrey Matshiqi – a tireless and respected commentator from the Helen Suzman Foundation – writes an op-ed piece in Business Day on Tuesday, 18 September, and the Freedom Front bursts forth today, proving their racist thinking, as we all felt when they originally floated the idea some weeks back. And so I replied today – as a MINORITY RIGHTS ACTIVIST – looking only at GAY RIGHTS . . .
shunned, ridiculed, humiliated and even physically abused. As a gay man, I do. First-hand! My full reply is linked here below and I’ve just submitted this to the editor for consideration in this very skewed, ‘racist’ debate. When ‘whiteys’ think their constitutional rights as a minority are being infringed, they need to think far more widely. Their narrow-minded focus can fracture a united rainbow this land needs to build. Are YOU thinking ‘minority rights’ ? « Neil Aggett : Restorative justice – at last !